A new fantasy series from Stephen Donaldson, the author of the Thomas Covenant chronicles and the two Mordant’s Need novels. The first book, The Seventh Decimate tells the story of the war between the nations of Amika and Belleger that has raged for generations. Its roots lie in the distant past, beyond memory. Sorcerers from both sides rain destruction down on the battlefield, wielding the six deadly Decimates of fire, earth, wind, water, lightning, and pestilence. Prince Bifalt is the first to bring repeating rifles to the battlefield and his actions cause a change in the war. After he kills a Sorcerer in the fighting, a cautious détente descends upon the conflict, but this détente brings with it the complete removal of magic from Belleger. Two years pass and Belleger suffers as harvests fail and their previous reliance on magic for everyday tasks is exposed. Bifalt recovers from his wounds on the battlefield and takes counsel with his father before embarking on a desperate quest to find lore that will return magic to the kingdom. The Seventh Decimate has some naming puns, Belleger – belligerent, Amika – amicable, which are in keeping with some of the subtexts in Donaldson’s previous work, but in this case, the link is more obvious and feels a little like the author has too much regard for his own cleverness. The story of the first book is told from Prince Bifalt’s position and he exhibits many belligerent qualities in his conversations and actions, but also, from his perspective, the Amikans appear to be a highly motivated enemy follow their own equally self-centred rationale. The story of The Seventh Decimate suggests there will be a flip in the coming series, exploring the plot premise like an onion, in a similar way to how Donaldson managed his Gap series. Donaldson’s writing is strong throughout and holds the reader’s attention. The prose is economical and carefully constructed. Some of the thematic excess of Donaldson’s previous stories, which dates them, is absent here, showing how the writer has grown with the changing times. Here is a writer who has explored the themes of grimdark before grimdark existed, and well knows how to deliver epic qualities in his fantasy prose. However, these elements are intentionally restrained. Like the Gap into Conflict, The Seventh Decimate is setting up what is to come, a more detailed exploration of the narrow world we are being introduced to. Donaldson has always liked prickly characters. It is difficult for the reader to like Prince Bifalt in his moments of ignorance and anger. The character is not the most subtle of Donaldson’s flawed protagonists, but he is consistent and the exploration of his nature is carefully structured to grant the book its conclusion and set up what is to come in the future. In the fantastical exploration of gunpowder meets magic and the self-centred motivations that instigate war, there are some comparisons to be drawn with Adrian Tchiakovsky’s Guns of The Dawn. In many respects, there is a similar narrowness, but Tchiakovsky develops this theme, narrowing the world around his character, whereas Donaldson is starting from narrow and opening out. 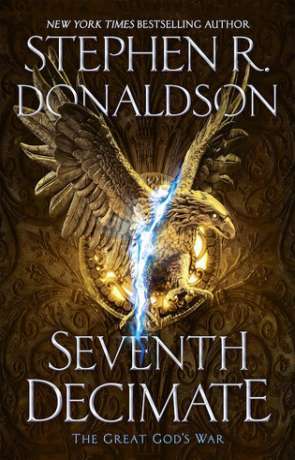 The Seventh Decimate is a strong novel and promises much for what is to come in Donaldson’s new series, The Great God’s War. Written on 15th March 2018 by Allen Stroud.